Luis Felipe Neri Alfaro was born in Mexico City in 1709. 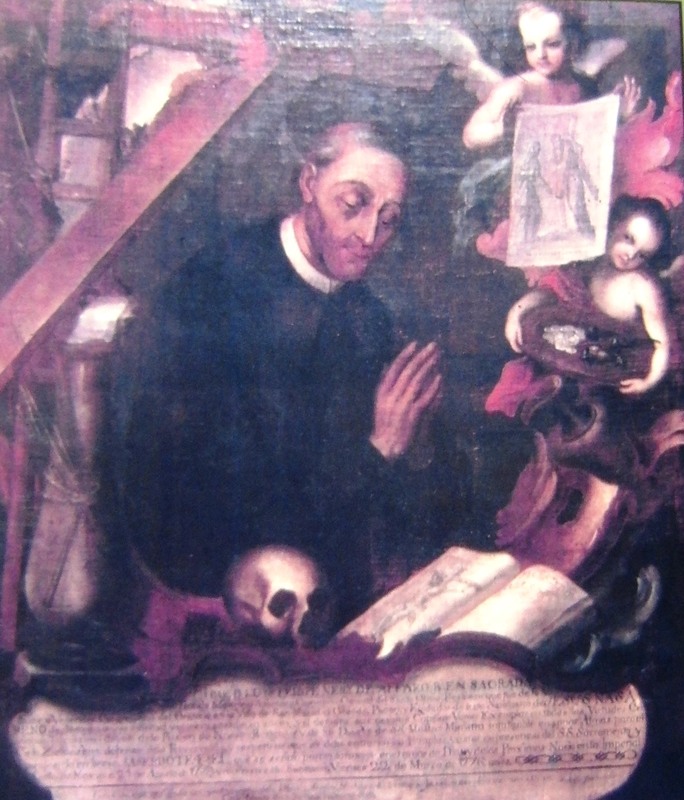 He received a theology title in 1729 and traveled to San Miguel the Great (now de Allende) in 1730. There he joined the Congregation of Oration of San Felipe Neri to further his religious studies. 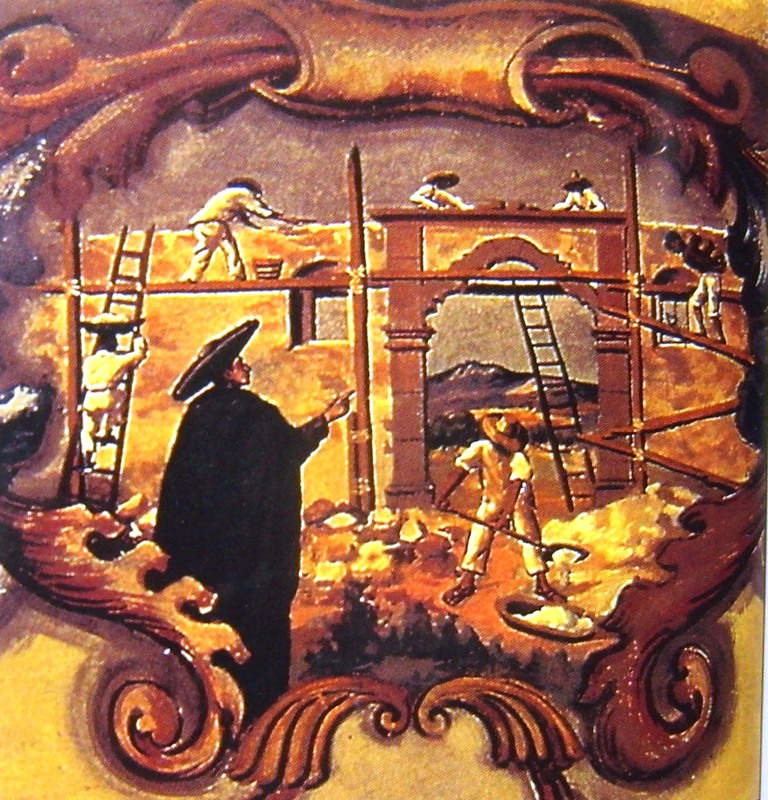 In 1740 Alfaro was traveling outside San Miguel when he fell asleep under a mesquite tree in a place called Atotonilco. The word means “Place of the Hot Waters” in Nahuatl because of the 27 hot springs in the nearby area. It was here he had a vision that resulted in the creation of the Sanctuary of Atotonilco. He said Jesus came to him in a dream and told him to build a “place of penitence and prayer” where the tree was located. Alfaro, believing he was being guided by Divine Providence, began construction of the first phase of the complex immediately, laying the corner stone on May 3, 1740. The Sanctuary would be his life work. Alfaro would be its priest for the next 36 years. Father Alfaro was a believer in punishing and scourging his body as part of his religious regimen. He whipped himself constantly, wore a vest of thorns, sandals with inward spikes and knee guards that caused severe pain when he walked. Alfaro slept in a coffin. This punishment was administered daily until his death on March 22, 1776. Believers say he died at 6 AM Atotonilco time which was 3 PM Jerusalem time – the same hour Jesus passed. Father Alfaro’s body rests in a tomb in the wall beside the main altar with his painted epitaph nearby. 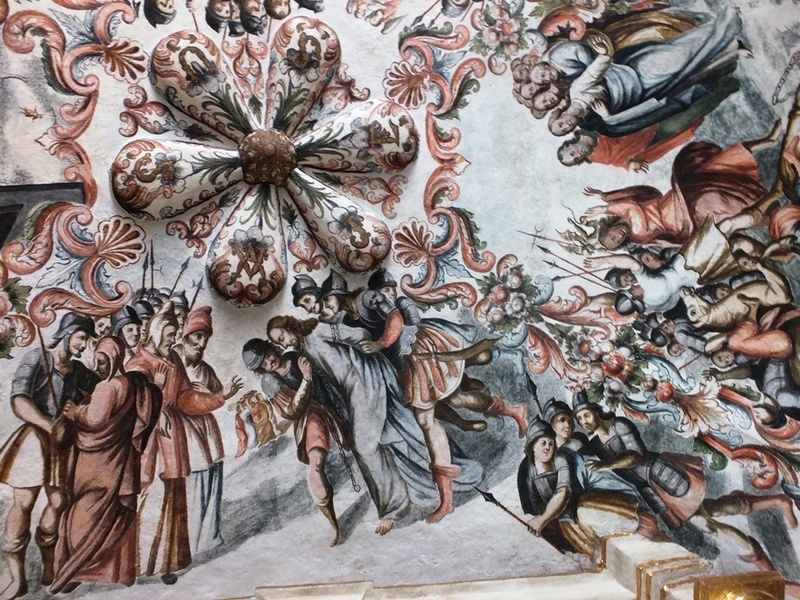 The architectural style of the Sanctuary of Atotonilco is referred to as Mexican Baroque. The exterior with its cruciform clerestory windows resembles a rather plain Spanish fortress. Its nave stands 36 feet high, the domes at 32 feet and the bell tower at 65 feet. Nothing on the outside of the structure foretells what pilgrims and visitors will experience once they enter the church. Approaching the entrance pilgrims pass over a small platform that was once the Sanctuary’s cemetery. Large wooden doors separate the exterior world from the narthex. The narthex has tall painted panel doors with many biblical scenes. The art form of this area as well as the interior of the Sanctuary is known as Mexican Baroque Folk style. 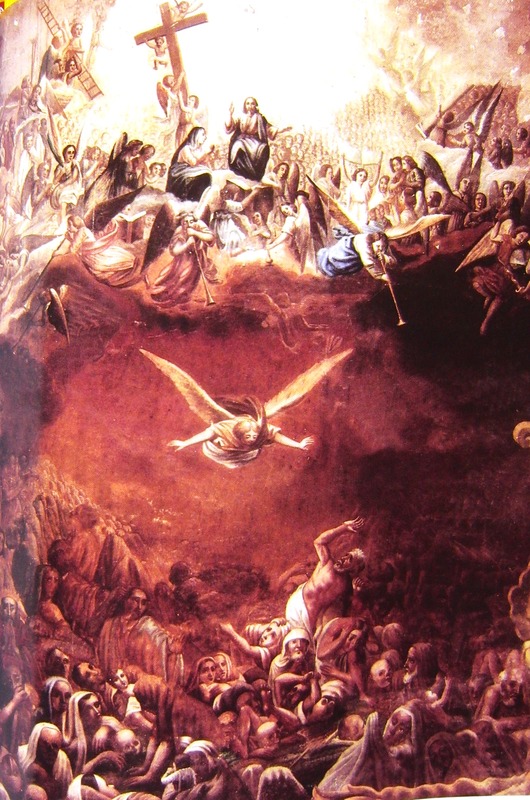 The murals in the narthex mainly focus on the Last Judgment with sinners being shipped off to Hell and the faithful to Heaven. Scenes feature saints, monks, humans, animals, snakes, dragons and lots and lots of demons and devils. Passing from the narthex to the nave one enters a polychrome grotto of paintings that cover every inch of the walls and ceiling. 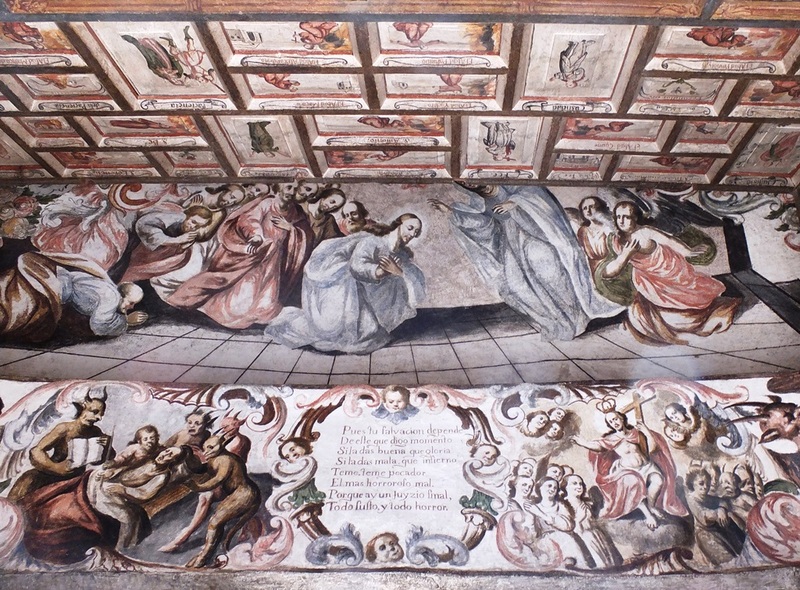 Most of the work in the Sanctuary was done by an artist from Queretaro named Miguel Antonio Martinez de Pocasangre and assisted by Juan Correa de Miguel Cabrera. The ceiling from the narthex to the main alter is covered with scenes from Jesus’ life and eventual death by crucifixion. The walls of the nave are also chock-a-block with sacred murals on a wide variety of subjects. Upon close observation one will see paintings of Jesus, Mary, Judas, Peter, John the Baptist, Jordan River, Pontius Pilate, Passover, Barabbas, Mary Madeline, Simon of Cyrene, St. Veronica and many, many more. Over the centuries since its founding, the murals in the Sanctuary suffered severe deterioration due to their proximity to the hot springs. Humidity took its toll. 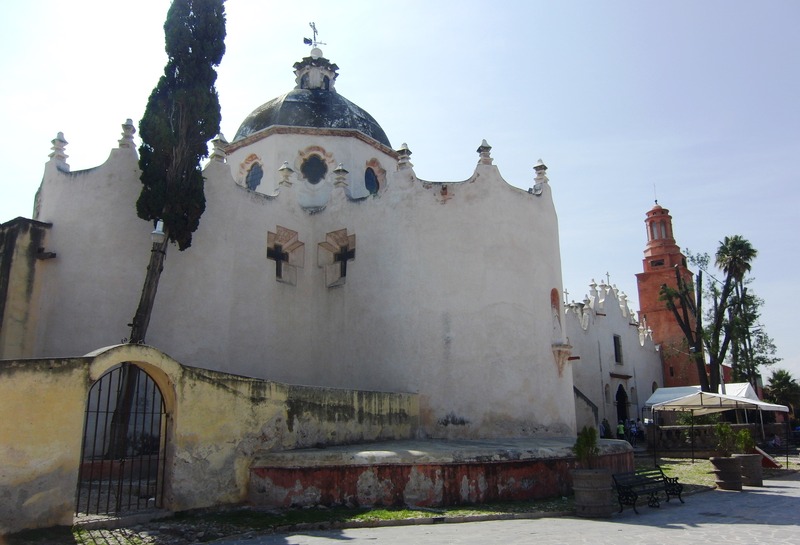 When historians and archaeologists recognized the value of Atotonilco, funds began to be raised to save this unique structure. Restoration began in 1994 and continues to this day. About half of the original work has been or is being preserved. One of the interesting religious objects at Atotonilco is the Lord of the Column. This is a 5’ 9” polychrome wood sculpture from the 19th century. It is a statue of Jesus, wearing a sorrowful expression, drenched in blood from whippings and tied to a stone column. 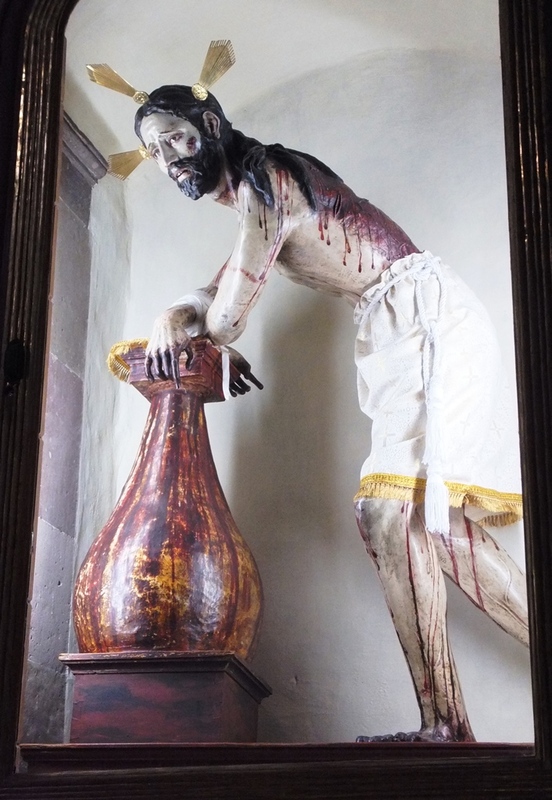 This statue has been carried the approximately 10 miles from Atotonilco to San Miguel de Allende on the Saturday night before Easter and returned Easter night since 1812. It is quite a spectacle with pilgrims, penitents, bell ringing, fireworks and flame torches. Visit this sleepy village during the week and you will probably be the only visitor. However, come Sunday the town will be full of pilgrims seeking penitence and penance. They purchase rosaries, crucifixes, sack cloth clothing, ropes, whips, crowns of thorns and three-legged wooden stools. They come to inflict punishment rituals upon their bodies. 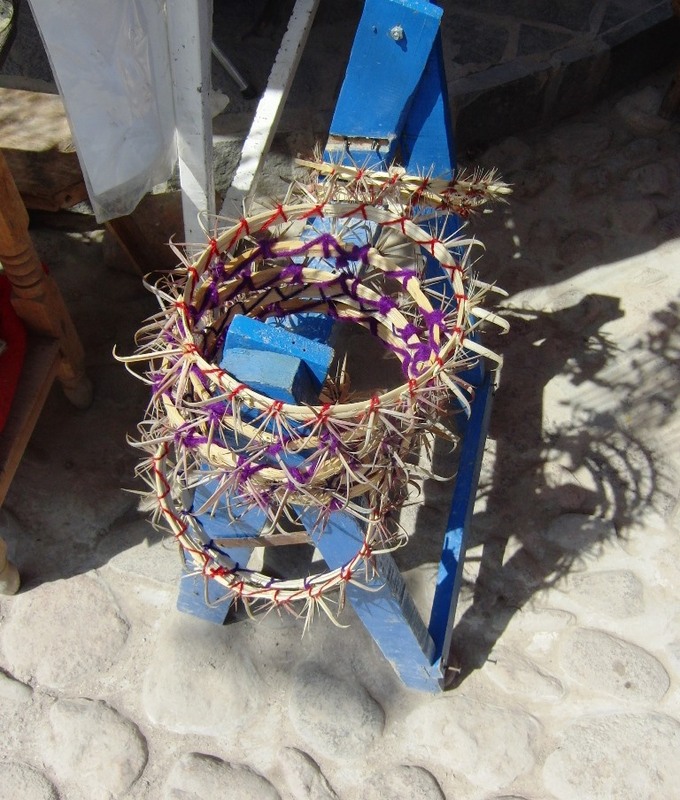 They cut ears, arms and legs until they bleed and use barbed maguey leaves as whips. Once the punishment ends they go to the hot springs to seek purification. As you might guess this tradition was introduced by Father Alfaro in 1765. The Sanctuary of Atotonilco was designated as a UNESCO World Heritage Site in 2008. Additional photographs may be found in the Gravesites Gallery.